Thanks to rapid technological and procedural innovations in the healthcare industry, operating rooms are constantly evolving to house the latest cutting-edge, life-saving medical equipment. But with finite space and changing equipment, placing new technologies safely and efficiently into operating room design is often a major hurdle. As a manufacturer or distributor of operating room (OR) equipment, you understand the importance of simplifying OR design. Just as doctors are trained to make accurate incisions that can save the life of a patient, an operating room must be precisely designed to support both the needs of the patient and the needs of the medical team. Dimensions and placement must be chosen carefully to ensure that the room has an efficient and functional flow, helping surgeons, nurses, and doctors perform their jobs well. But before you start thinking that your customers can only design operating rooms with blueprints and schematics, configure price quote software (CPQ) can actually help your customers easily put together ORs on their own computers and devices. Medical equipment companies such as Skytron, BFW, Image Stream Medical, Trumpf Medical and more are leveraging visual and virtual CPQ solutions to design OR suites, quote medical products, and validate layout designs. To help you understand exactly how CPQ software helps, check out these three ways CPQ is transforming operating room design. When designing the layout of an operating room, every little detail must be taken into consideration to guarantee the safety and efficiency of all those involved with the procedure. And because every operating room is not created equal, it can be challenging for your customers to design each operating room to custom specifications and dimensions. A CPQ solution with a 3D floor space planning platform helps OR designers create exact 3D layouts of operating rooms. This allows planners to place equipment and devices accurately around the OR. Our own 3D product configurator does this with an easy to use drag-and-drop tool. And as your customers place items in the room, they receive accurate real-time quotes on the medical equipment used for the design. This allows OR designers to create the room and order important equipment from you at the same time. In addition, each layout a customer creates is fully customizable, since not all operating rooms use the same equipment or are used for the same procedures. With these features, each operating room design takes full advantage of the floor space available without sacrificing safety or function. Then, once the design is finalized, various users and stakeholders can view an exported version of the layout to visually understand the design of the newly created operating room. Because you're a manufacturer of large, custom medical equipment, you understand that most of your customers rely on online images and information to set their expectations and make purchasing decisions. This means your customers usually never see their complete order until the entire OR is in place. But if your customers don’t see what they’ve designed or purchased from you until the final moments, how can both you and your customers be sure that their expectations are met? 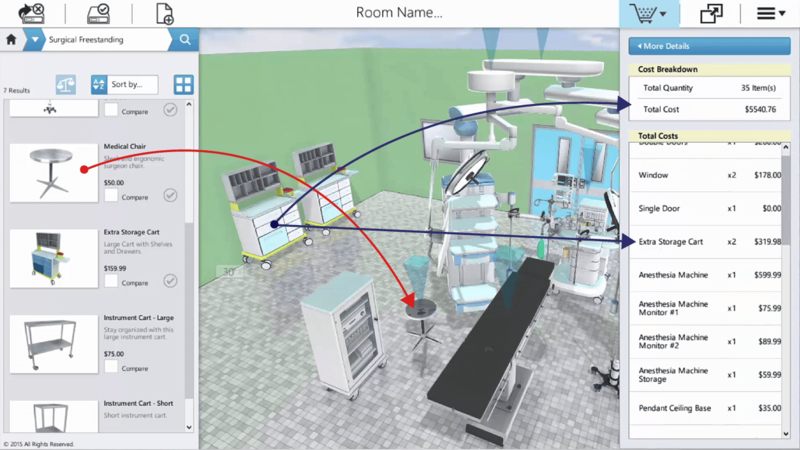 To help visually communicate the operating room design, CPQ software can offer a virtual reality product configurator where key individuals can design the operating room firsthand. This virtual environment enables your customers to explore the operating room and experience any areas that could potentially affect the safety or efficiency of the medical staff. If any design elements in the operating room need to be changed or reconsidered, changes can easily be made to fit the expectations of key stakeholders. Through VR, your customers can experience the final product before making a purchase to ensure they have placed and ordered the correct equipment. A design flaw will undoubtedly affect your bottom line. Ordering and design errors can be costly as equipment placement mistakes can be expensive to fix. And mistakes aren't all that uncommon as ORs need a lot of equipment and manually managing orders and quotes can result in a multitude of errors. Fortunately, CPQ software reduces errors and the need for quote revisions, keeping customers happier in the process. In fact, CPQ software allows customers to receive accurate quoting as they design their OR to make customers aware of how their order changes as they work. This results in accurate quoting that meets customer expectations, eliminating pricing surprises and order errors. If your customers come to you to design multiple operating rooms, each with their own set of unique equipment, CPQ software can help you reduce order errors and increase customer satisfaction. See it for yourself first hand by checking out how our product configurator designs operating rooms or by requesting a product demonstration today.